T-Sketch is not like those shirts made by arrogant companies that put THEIR message on YOUR chest. 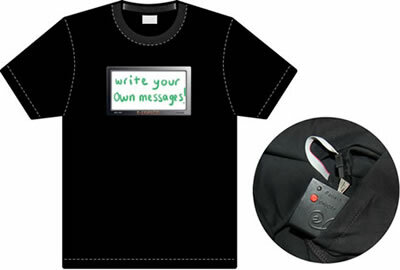 T-Sketch lets you put YOUR message on YOUR chest. Anything that’s drawn on the wipe-clean panel activates a glowing light beneath so that it lights up. You can also change the flashing sequence to suit your preference – from a gentle glow right through to a pulsing strobe. I'd be amazed if anyone but me thought of the thought screen worn by space aliens from another universe in the classic 1931 story The Emperor of the Stars, by that great team Al Schachner and AL Zagat. Via T-Sketch shirt has a lit-up whiteboard on front.